I was super pleased with how this chicken came out. It’s moist, super flavorful, and warming. This was my first time using a Moroccan spice mix called ras el hanout which I found at the Giant and picked up because I’ve started seeing it in some recipe browsing. I really liked it. It adds a ton of flavor and a little heat. Paired with the apricots in this recipe and this chicken is anything but boring. In a large skillet, heat oil over medium-high heat. Add garlic and cook for a minute or two until garlic begins to turn brown. Remove garlic from pan and discard. Add onion and sauté until tender, add carrots and cook until beginning to soften. Add ras el hanout, salt, pepper, red pepper flakes, cinnamon, and cook for a minute. Add chicken and toss to coat, cook for about 5 minutes until chicken is browned. Add lemon zest and lemon juice and dried apricots. Cover with a lid and allow to cook over low heat for about 10 minutes. Meanwhile, bring water to a boil in a sauce pan. Once water is boiling, turn off the heat. Add couscous to the pot and cover with a lid. Let stand for 5 minutes and then add raisins and fluff with a fork. 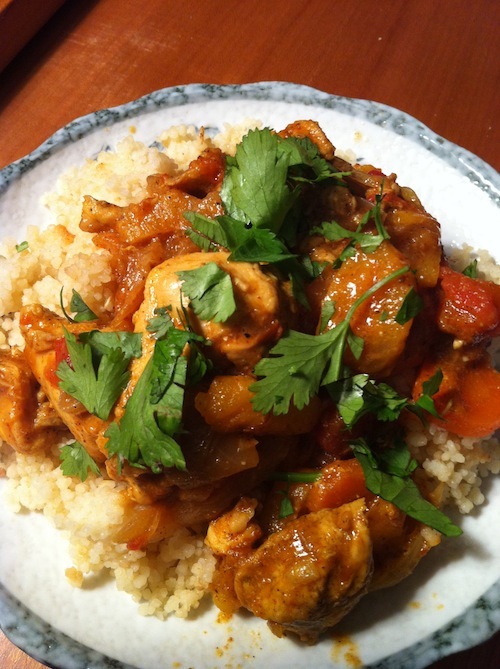 Serve couscous and top with chicken, then garnish with fresh cilantro. Loved this! I have been enjoying the leftovers! This looks delicious! I need to invest in some more daring spices. Thanks! New spices are always a fun adventure!